At his table at the Elon Community Church farmers’ market, Mike Ross displays boxes of tart muscadine grapes, bags stuffed with turnip greens and boxes of okra. A full half of the table is dedicated to squeeze bears and Mason jars topped with sticky, amber honey. Mike Ross has been a farmer all his life. His father and grandfather were farmers, as was his wife’s family. Ross is a regular at the Elon Community Church farmers’ market and at farmers’ markets in Gibsonville and Burlington. Ross said people will come up even in the wrong growing season asking for favored produce. Ross gradually added honey to the list of products he wrests from the soil of Alamance County. By his estimate, he started keeping bees around seven years ago. Ross has 40 colonies of bees. With an average hive population of 15,000-20,000, there are about 68,000 bees buzzing around his farm at any given time. Every now and then a hive will get too big, packed too tight with workers and drones. Then a swarm happens, where about half the colony will pick up and move, scouting out a new hive location. They take the old queen with them, Ross said, and the old colony will create a new queen. The production season for North Carolina honey bees is from April to June. This is when bees start setting aside extra honey and still have plenty left over. Ross said he usually harvests five to 10 gallons of honey per season. He can store the honey almost indefinitely, because it never spoils unless contaminated with water. Ross can also rattle off a list of the benefits of honey. Honey never spoils, unless it gets contaminated with water. It is good for regional allergy sufferers because they eat the honey, are then exposed and grow resistant to whatever pollen they are allergic to. It is even used in medical settings — microbes cannot grow in honey, Ross said. There’s no exact science as to why honey can be so useful. “That’s just how it works,” Ross said. In recent years, there has been a fear that honey bees in North America are dying out. An introduced species of parisitic mite called the varroa is attacking bees, Ross said. But his thousands of bees are helping pollinate wildflowers througout the county. Though beekeeping is against the pet policy of Elon University and surrounding student apartments, interested students can take a 10-week class on beekeeping offered by Alamance County. The class starts in January and meets on Tuesday nights. Ross took the class years ago and is now involved with the Alamance County Beekeepers, an association of apiary-minded residents. 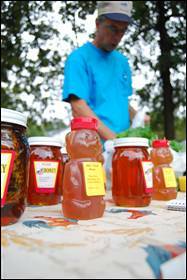 During the regular 3:30-6:00 p.m. time of the Elon farmers’ market on Oct. 7, Ross and other beekeepers plan on showing off their bees as well as varieties of honey and recipes. Note: This article won honorable mention in Feature Writing at the 2010 NCCMA College Media Awards.